A friend who has a vast knowledge about the more technical aspects of computing, helped me with getting write allocation and write combining working on the AMD K6-2 processors. You can check out his website here. ​What we found was that some of these tools below, only worked with the regular K6-2, and possibly the K6-III, but not with the mobile CPUs, the K6-2+ and K6-III+. This was quite confusing at first and I tried various motherboards and other components. After enabling Write Combining I saw a significant boost in DOS VESA games, such as Quake, Duke Nukem 3D or PC Player Benchmark at 640 x 480 resolutions. Performance of DOS 320 x 200 games didn't improve and Windows 3D games such as GLQuake, Incoming or 3DMark2000 saw a measurable, but small, performance improvement. With the K6-2, and possibly K6-III, under DOS you can use MXK6OPT or SETK6V3. The first is easier to use, the latter has more options to configure. Under Windows you can use CTU, this is a very powerful tool with some other tweaks. With the K6-2+ and K6-III+ only MXK6OPT worked for me under DOS. Here are a collection of K6-2 utilities and tools that can be a bit hard to find. Enabling Write Combining under DOS with the SETK6 utility. This is on an AMD K6-2 400 CPU. G. Broers 2014, 2015 - Free for non-profit use. -Intel called this feature (Enhanced) SpeedStep. -AMD called this feature PowerNow! -VIA/Centaur called this feature Longhaul, but later renamed it to PowerSaver. L2D - L2 Cache Disable. L2E - L2 Cache Enable. -Compatible with MS-DOS, both with and without EMM386 loaded. -Compatible with Windows 95, 98 and ME. -SetMul requires CWSDPMI.exe or a compatible DPMI host. -SetMul sets up a Ring0 exploit to get privileged access to the CPU registers. these systems are not supported. AMD K6 Central Tweaking Unit (CTU), for Windows. k6dos.sys unloads itself from memory and returns any used memory to DOS. and will enable write combining GEWBED mode. run before any other drivers are loaded in the config.sys file. command line, 5.5x is assumed to be the desired multiplier. only if you desire a hole at 15-16 meg in memory for write allocation. This program will work ONLY with k6+ CPUs, do not use it with any other CPU. Copyright Kyle S. Brant 2001, all rights reserved. Use by home users or individuals in a non-commercial setting is allowed. Duplication and reselling of this program is strictly prohibited. but just not be fussy about what cpu model it runs on. separately. Be warned though that this one does the equivalent of "setewb 2"
think "setewb 1" is a much better option. check that you have the correct processor type. Windows Startup Folder (Win95/98/NT), so its executes automatically at Startup. SetK6 Setk6D without parameters outputs the current status. Setk6 /on activate Write Allocation for all memory under Windows. NOTE : In DOS the memory amount must be indicated! The CXT processor supports so-called Write Combining for uncached MEMORY. several resources can be entered here. the 'M' suffix denotes a decimal number. No 'M' defaults to Hex. the filling rate (Memset) for 32 KByte a large memory area into the memory. intitialize the processor, it runs about 5 % slower than necessary. SetK6, Setk6D without parameters show the actual state. under DOS you always have to specify the maximal memory ! you can program the physical address and size of the LFBs. accesses and one for the hardware accelerator. You even can specify an attribut, i.e. ​Look in the help file for additional information. Phil: This is a really cool Windows utility. Let's you enable Write Allocation, Write Combining and other tweaks. ​Program : k6clk* sets the power-now soft-multiplier for the k6-2+ and k6-3+. Files : k6clk.exe, 8,336 bytes, 10-22-2000.
: k6clkw.exe, 8,400 bytes, 10-22-2000.
: k6clkini.com, 21 bytes, 10-22-2000.
: k6clkwin.exe, 178,688 bytes, 10-22-2000.
: k6ckptch.exe, 14,440 bytes, 10-22-2000. 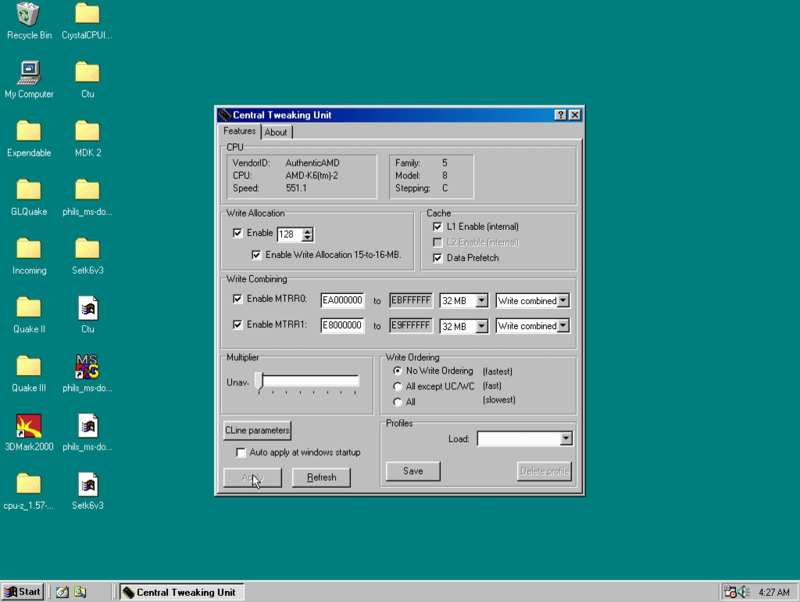 Limitations : Probably only suitable for Dos, Win95, Win98 and 98SE. Don't load emm386.exe (in config.sys) if using this software. from autoexec.bat when starting windows but can't run from within Windows. (typically during autoexec.bat) before it can run. that must be run BEFORE either k6clkw.exe or k6clkwin.exe can be run. IO (Input/Output) address resources used by both k6clkw and k6clkwin. require any IO resources and is not affected by this patch. your hardware then there is no reason to run this patch. 2, 3, 3.5, 4, 4.5, 5, 5.5 or 6, sets the cpu clock multiplier. k6clkw.exe and/or k6clkwin.exe can change the multiplier later. can be run from within windows. if you like though you would typically launch it from a windows shortcut. The program accepts one or two optional numerical command line parameters. multiplier value and the second parameter is the initial mulitplier value. for the Power-Now base address. exit the program and restart it (as many times as you like). There are three valid work arounds for this problem. setting as 4.5x regardless of what it's true (hardware set) value is. un-does some of the required initializations that k6clkini.com sets up. sentinal file when an actual soft-multipier setting is made. report "not yet set" to requests for the present multiplier setting. yet know the multiplier setting. unimportant and only the presence or absence of the file is detected. program will not report any errors if it is not present. NOT accessible to programs with "normal user privileges" under windows. programs (instead of dedicated drivers). actual hardware I/O device in the same address space, it's no problem). and leaves it open so that k6clkw and k6clkwin can access it as required. and sending your cpu speed crazy-date. the PC boots and is compatible with DOS, Windows 95 and Windows 98. 2. Do I need K6-Pro? K6-Pro will provide some performance enhancements. performance out of your new processor. 3. How would I know if my BIOS supports the K6-series processors? section that describes the various jumper settings of the motherboard. of support for the K6 processor. probably does not correctly initialize the K6 processor. 4. What is the Performance Gain with K6-Pro? not support the K6-2 and better processors. Improvement with the K6-III was up to 16% for integer operations. 5. How do I use K6-Pro? K6-Pro is loaded as a device driver. original CONFIG.SYS file is changed to CONFIG.K6. 6. What if K6-Pro does not work? Unlike a BIOS upgrade, you can undo the installation of K6-Pro. This will restore the original CONFIG.SYS file. comments or suggestions. We try to answer all our emails. 8. How do I register K6-Pro? the removal of the nag screen. Or call BMT Micro at 1-800-414-4268. CAUSE SYSTEM DAMAGE IF YOU OVERCLOCK YOUR CPU BEYOND THE POINT OF STABILITY. CREATE THE NT/W2K DRIVER. SEE BELOW FOR ADDRESS. allocation, and control of write combining modes of k6-2 CXT and k62/3+ CPUs. Unzip all the files in the zip archive into a single folder of your choosing. close most of the time). K6SPEED will begin execution without changing your cpu speed. When you click on FASTER or SLOWER, the multiplier will be incremented/decremented. data on your hard disk. will bring up a popup menu providing access to all of the functions available. window"), K6SPEED will hide the main window from view. when the program is started. write combining settings in a convenient display. NT/W2K support via driver named k6speed.sys. code since you aren't going to see it anyway). as a lesser privileged user. old files and run k6speed as Admin. to install the newer driver file. consuming state (note, this functionality is still under development). ​IMPORTANT NOTE: These are "real mode" programs, to be run from Autoexec.bat. They will not run if you have "device=emm386.exe" in Config.sys. k6waon does NOT leave a "hole" in the address space at 15..16M. if you have some IO device that maps to this region. MOST PEOPLE DO NOT NEED TO USE k6waonh and should just use k6waon. Examples : k6waon 128 ; Turns on W/A for 128MB of memory (no 15..16M hole). : k6waonh 64 ; Turns on W/A for 64MB memory (with hole at 15..16M). whether or not it is a cxt version then read the following. steppings 10..15 as 'A'..'F' respectively). currently doesn't work with k6-2+ and k6-3+ processors. k6-2(cxt core), k6-3, k6-2+ or k6-3+ cpu's. mode drivers loaded. Won't run if emm386.exe is loaded. "k6wc.exe Hex_Address1 MB_size1 Hex_Address2 MB_size2"
for a 16 Mbytes range at starting at hex address 0xE0000000. Example3: "k6wc.exe 0 0 0 0" ;Disable all write combining. then 16 is a good default value. size of the write combining ranges in 128KB blocks instead of whole megbytes. memory (see the last FAQ). Q. Why are 2 programs (k6wc.exe and k6wcx.exe) needed to enable write combining? as it was because for some people the original program will be easier to use. Q. So how is k6wcx.exe different from k6wc.exe? the size of the write combining range the two programs are identical. "k6wc e8000000 4 ec000000 8"
"k6wcx e8000000 32 ec000000 64"
range starting at address ec000000. Q. Why would you use k6wcx.exe instead of k6wc.exe? A. If you want to enable a fractional megabyte write combining range. For most "linear frame buffers" (pci frame buffers) this is not needed. "k6wcx e0000000 128 a0000 1". 128KB (1/8 MB) range at a0000. Function : Enables extended write merge buffering for the k6-2/3 cxt core. setewb : Reads and displays current EWB mode if run without parameters. setewb 2: Sets the EWB mode to "No write ordering". (Fastest). setewb x: Any parameter other than 0,1 or 2 invokes help. internal and external write events. ordering for all memory ranges. Mode 1 relaxes the write ordering only on the write combine space. Mode 2 relaxes write ordering on all memory space. has any adverse effect on system stability then select a lower mode.